I know you think the best time to tell you about shows I’m doing in a festival is before that festival starts, but that’s just because you assume you know how this crazy business works. In fact, recent studies have shown that the optimal time to let audiences know about shows you’re doing is EXACTLY HALFWAY THROUGH the run. Doesn’t sound right to me, but a guy on a tram told me. He then said something about needing a dollar and that he had a legion of spiders, so I assume he went to Uni or something. Anyway, I’m in Melbourne doing a show called “Edinburgh Festabesta” at the Last Laugh Comedy Club. The great news is that also appearing on the lineup is Troy Kinne and probably my favourite comedian in Australia, Lawrence Mooney. Loz has the ability to make me laugh from so far down in my gut that I make noises I didn’t know I could make. I have sat in audiences and laughed so hard I actually cried, and my stomach burned from joy. Not only that, he has a special place in my heart because I had a drink with him in Adelaide many years ago with a lady friend of mine after a show. He asked her if we were dating and although she meant to say “no”, she accidentally said “not yet”. Flash forward to a few months ago and I made her my wife. Now I don’t know if she was scheming me or if Loz put the suggestion into her head, but most probably his comedy released endorphins into her soul, I said hello and she mistook the feeling for love. Anyway. 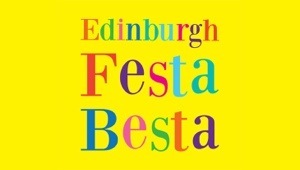 I’m really enjoying the show, and if you’d like to come along, you can get tickets here: Edingburgh Festabesta. Also, you totally missed Festival Fishbowl in the Adelaide Fringe, but you can check out all the episodes on YouTube. P.S. If you wondering why I didn’t perform a new show in Adelaide or Melbourne this year, its because we got married in November, I moved back to Adelaide, then went on a honeymoon and got back the day before Fringe started. I’m super-keen to do one next year, but I was also keen to not ruin our honeymoon by being my usual self-absorbed pre-festival self. I found plenty of other, newer ways to ruin it.